Bailey was a promising F3 and F3000 driver who got his F1 break with Tyrrell in 1988. Alas, Ken Tyrrell's team was at an all-time low at the time and Bailey's season was largely a non-qualifying affair. 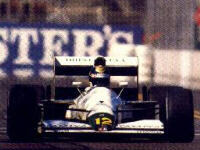 To the surprise of many the Englishman got a second F1 opportunity in 1991, this time with Lotus. Here we see him on his second F1 "debut" at Phoenix. But as with Tyrrell, Lotus was already on its way down the grid, having to resort to a year-old car which suffered deerly from switching from a Lambo V12 to a Judd V8. Apart from that, it must be said, Bailey's talents again seemed just too underdeveloped to force a breakthrough in F1. And a certain Mika Häkkinen playing his part as the eager up-and-coming teammate didn't help either... Bailey did score a point at Imola though, the only race for which he qualified, but after a handful of Grands Prix Julian was replaced by the returning Johnny Herbert. Like many F1 rejects Bailey sought refuge in touring cars but despite several opportunities for Nissan, he also failed to deliver in tintops. He has been luckier in GTs, lately even winning in the British GT Championship, sharing a Lister Storm GTL with Tiff Needell.